Kick off the holiday season with us! For a flurry of gift ideas & a delightful shopping experience, join us for the annual Taste of the Holidays Wine Walk from 6-9 pm! 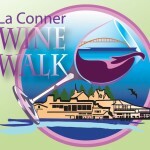 Enjoy the art and taste many of the finest Washington State wines while strolling thru Downtown La Conner’s local shops! Enjoy this walking tasting tour through La Conner, one of Washington State’s most-loved getaway destinations!